How Many Cannabis Plants Per Square Metre? Home>Blog>How Many Cannabis Plants Per Square Metre? What’s the magic number of marijuana plants per square metre? Whether you are a beginner grower or a veteran cultivator, finding the solution is the key to unlocking the maximum potential of your grow-op. This text breaks down the equation for the most popular cannabis growing styles. The optimal number of cannabis plants per square metre differs greatly from one grower to another. This is not a question that can be answered in isolation with a perfect number of plants every grower should aim for. Ultimately, the grower’s level of skill and experience is the X-factor. A grand master grower can crop a heavier harvest with one grow light and one female plant than a novice can with 10 grow lamps and 10 female plants. In this blog, we will help you make a customised cultivation assessment. Now, let’s figure out the right number of cannabis plants per square metre for your grow-op. HOW MUCH WEED CAN YOU REALLY EXPECT TO HARVEST PER SQUARE METRE? The best data on indoor cultivation comes from a 2006 study called Yield of Illicit Indoor Cannabis Cultivation in The Netherlands by Marcel Toonen PhD, Simon Ribot B.Sc., Jac Thissen M.SC. Focussing on 77 illegal indoor hydroponic grow-ops in the Netherlands, they discovered a median plant density of 15 plants/m², using, on average, 510W/m². Moreover, as the study was published in 2006, we can assume the lighting used was exclusively HID. The data confirmed average yields of 505g/m² or close to 1g per watt of HPS light. Using comparable wattage next-gen LED lighting, the g/m² figure could be potentially even higher. The sea of green (SOG) is a high-volume cultivation style favoured by commercial cannabis growers. Essentially, all the available floor space is filled up with plants. Hydro growers typically pack systems to capacity. Soil/coco growers commonly use smaller 6l square containers to squeeze in as many plants as possible per square metre. Drip irrigation is preferred as watering large numbers of cannabis plants by hand is impractical and time-consuming. With the exception of feminized autoflowering seeds, high-quality clones of photoperiod varieties are essential to a smooth-running SOG. Cuttings simplify feeding, ensure a uniform crop, and generally help achieve maximum yield—provided you’ve selected a winning mother plant. A streamlined SOG can be low-maintenance with no plant training or pruning required. Vegetative growth is kept to the minimum. Adopting a 24-0 light cycle can make it as short as 1–2 weeks. Switching to a 12-12 cycle to induce bloom as soon as possible is the goal. This creates an even canopy of squat plants with few side branches. The best SOGs consistently provide quick-turnover harvests of short, fast-flowering plants with fat main colas. Breaking the apical dominance of a cannabis plant diverts growth hormone to the secondary shoots. This changes the growth pattern of the plant and promotes a bushier profile. By cutting away the tip of the main stem, topping is accomplished. Bushy plants fill out lateral grow space better and are easier to keep in the sweet spot under your grow light than tall, spindly plants. Pruning the main stem causes the pair of branches on the nodes below to become two top colas. Topping should be applied with sterile scissors during the vegetative growth stage as plants will need up to a week to completely recover. Flowering plants will not benefit from topping, and yields may suffer as a result. On the other hand, topping too soon will stress young plants and may stunt their growth. It’s best to top cannabis plants sometime after they have developed 6 branches (3 sets) and before the first buds emerge. Photoperiod strains vegged for an extended period can be topped repeatedly. 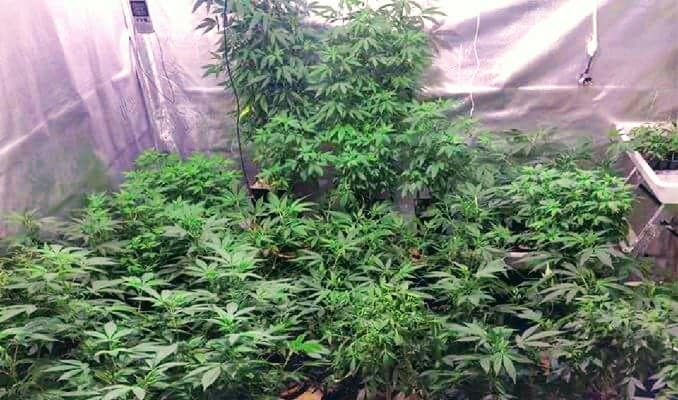 Home-growers popularised this practice to increase the number of top colas and to fill out larger grow spaces with fewer plants. Autoflowering plants can also benefit from early topping, but intensive pruning is discouraged. Fimming is a similar pruning technique to topping. Most growers prefer to pinch off 75% of the tip from the main stem between the fingers. Accuracy is not terribly important, but the results produced by a sloppy topping are impressive. Typically, the number of top colas is boosted to 3–4 post-fimming. It’s not as neat as topping, but it’s another great alternative to get more bud from fewer, bushier plants. As you would expect, this is a pruning technique to experiment with during the vegetative phase. Topping or fimming 5–10 plants in 10–15l containers will amply fill up one square metre of grow space. Low stress training (LST) is the technique of choice for microgrowers and autoflower growers looking to boost yields. It’s also common with pro-growers, and deployed with great effect in combination with topping, fimming, and the ScrOG method. Bending shoots and tying them to stakes, or pushing them down with gardening wire through holes in the lip of pots is all it takes to LST. Manipulating the main stem and branches during vegetative growth to create a bonsai plant, or flatten a sprawling canopy is the power of LST. There is no recovery time associated with LST, but as a hands-on technique, it has its limitations. You can only bend so many shoots. That being said, you only need 2–4 monster cannabis plants in 15l+ pots to get the most from one square metre indoors. The screen of green method (ScrOG) is arguably the best way any grower can completely utilise a square metre of grow space. Adding a mesh grid or screen to fill up the grow-op with nothing but chunky top colas is grand-master-grower-level cultivation. Top tier growers really can successfully bend, twist, and weave just one weed tree through a screen to fill the whole grow-op. Below the screen, through a combination of lollipopping and defoliation, the lower growth is stripped away. All plant energy and light are focussed on flowering a mass of budding tops. One or two cannabis plants in 25l+ containers scrogged can match the output per square metre of a 15-plant SOG.